This feature is available in Locus Map Pro only. NFC has enormous potential in quick transferring of a tiny amount of information. This information is transferred on NFC tags (kind of labels or stickers) and can be displayed or executed by a NFC-equipped mobile device. NFC can transfer both passive and active data. In the first case it can be e.g. a business card, in the second case some action, e.g. turning GPS on or starting track recording. 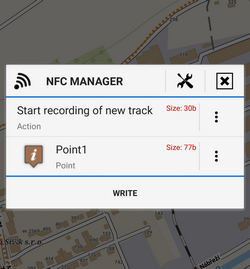 Locus Map offers a set of functions that can be written on a NFC tag. the NFC tag is programmed and ready for use. By closing the NFC manager the definitions are deleted. Locus Map can read NFC tags content or delete content from NFC tags. 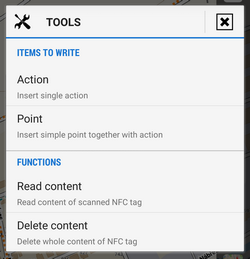 Place your device on the NFC tag and select options in the Functions part.